In the wee hours of the morning my youngest daughter climbed into bed with me. She said, “You don’t have to protect me anymore. Someone taught me the word ‘chupacabra‘, it’s a creature, it’s sneaky, and it’s my friend”. I was a little concerned…. And then this morning the older two relayed that last night, while they were all out getting fish and chips with their Dad, there was a rustling in a bush, and Natalie told them it was her friend, the chupacabra, and it would jump out and scare them. When she woke again, just now, I asked her who told her the word – her imaginary friend, the chupacabra. I literally have no idea where she learned this word. I can’t remember ever exposing it to her, and it’s not one of the common ‘monsters’ in my opinion. 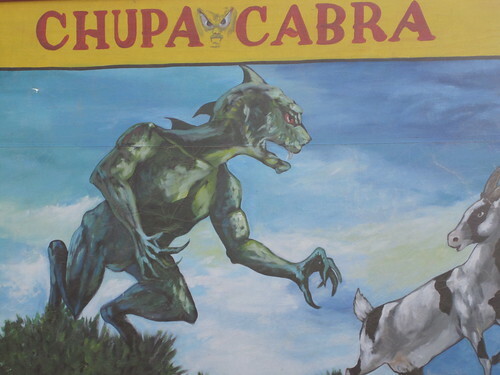 My kids know all about vampires, and zombies and werewolves, but not the chupacabra. Yeah, that’s a little bit creepy. Well, I have to say this really works for me today, so THANKS! Kids are so creative and brilliant.